It's easy to get started...just ask our first grade team! Why did they want a PLN? Teacher, Stefany Dombrowski, was discussing with her teammate, Erin Pennington, how overwhelmed she was with planning and creating rigorous lessons. They decided to take their problem to me, Alyssa Frank, a teacher who was discussing PLNs earlier that day. I asked them to decide what their problem was. 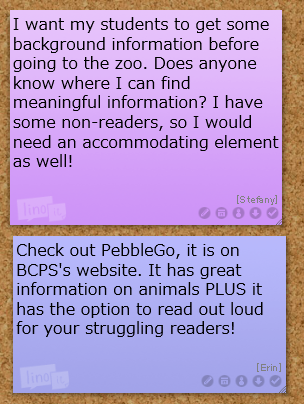 With this information I could help them build a PLN that fit their needs. Immediately, I realized this team of independent busy women needed a digital aspect to their PLN, their schedules simply were not matching up. We met during their team planning time to discuss digital tool that they felt most comfortable with. Some of the websites we explored included Lino-It, Padlet and Edmodo. The team felt comfortable using Lino-It and decided that would be their connecting tool. How they organized their online PLN? They decided to set the goal of checking their PLN page at least once every other day. This way they stay connected on their own personal time. Another way they organized this resource was to assign each teacher a color so they knew who they were talking too. Lastly, the women made a rule to place your post-it in a column when it is on the same question.